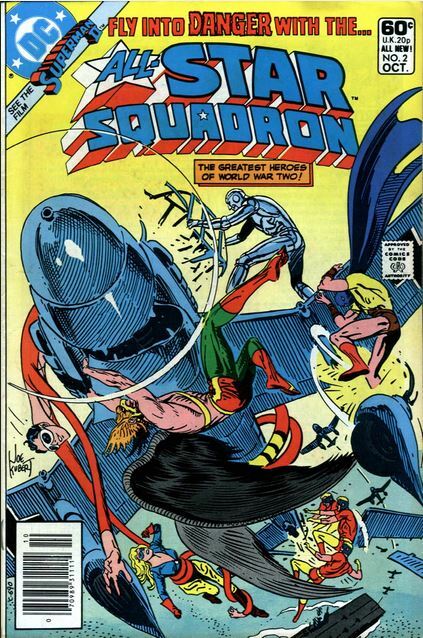 The newly formed All-Star Squadron is on the move. 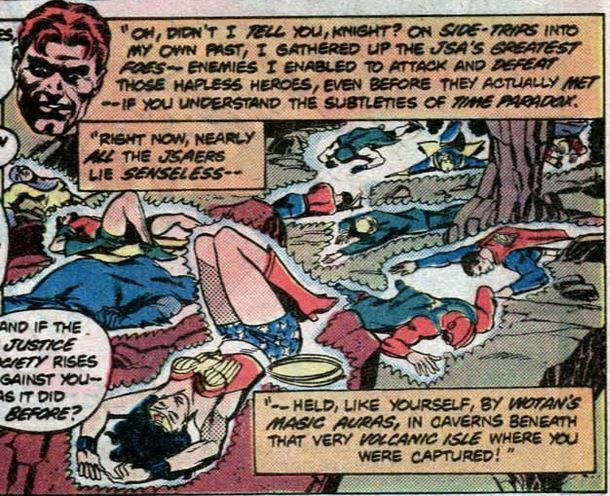 It's ridiculous and silly and takes its cue from Golden Age DC - those kind of comics just dare to be fun. As they travel along, they happen upon some local crime. 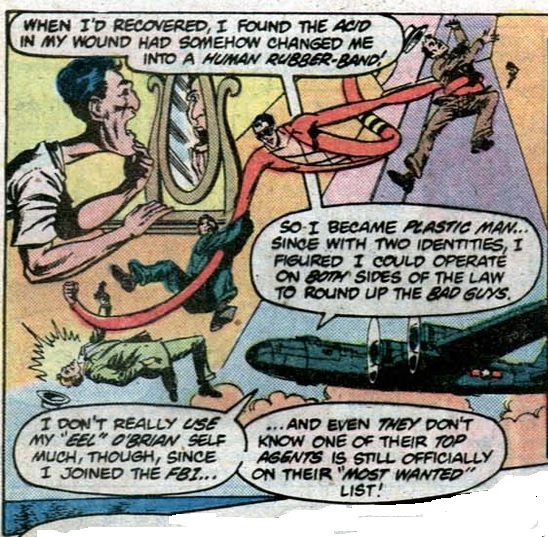 Plastic Man is immune to gunshots. 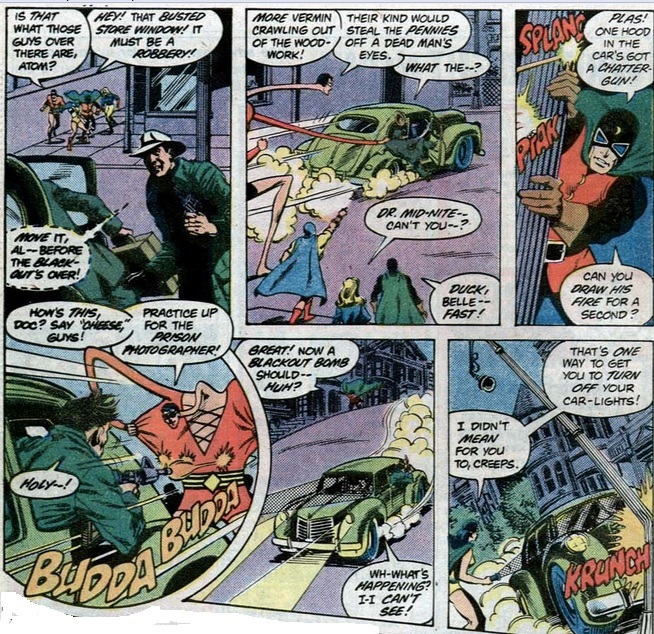 An excellent panel showing Dr.Mid-Nite using his blackout bombs and the Atom going at it the old-fashioned way. Johnny Quick shows just how fast he is. Liberty Belle caps the skirmish. The All-Star Squadron has been ordered to go to the West Coast to reinforce it in case of a probable but unlikely Japanese attack. They don't know that Per Degaton's attack is already under way. As they head for the West Coast, the Squadron get some time to tell each other about themselves. Hawkman starts the ball rolling. This is at a time when he still didn't have his atomic powers. The team is facing two pressing problems: The missing JSA and the defense of the West Coast. 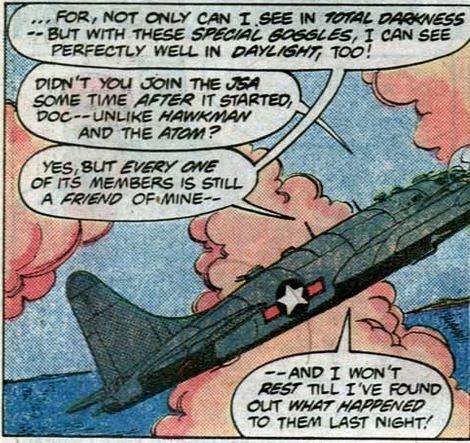 The Squadron has been ordered to the latter so they put the JSA situation in the backburner. 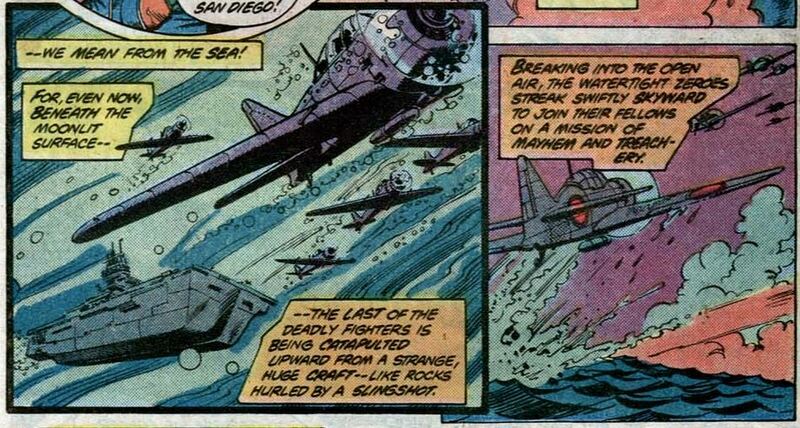 As they approach San Francisco by plane the Squadron becomes aware of Per Degaton's Zero fighters closing in. Here's an even closer look at the underwater launching of these Mitsubishi Zeroes. Here's the author of all the upcoming mayhem. Per Degaton is from 1947. Having the ability to time travel he heads off into the future and raids it for technology like this underwater aircraft carrier. He then goes into World War II with this superior technology. Back in the sub, Per Degaton is in the mood for telling stories. We get a delightful window to a story from All-Star Comics #10 circa April 1942. 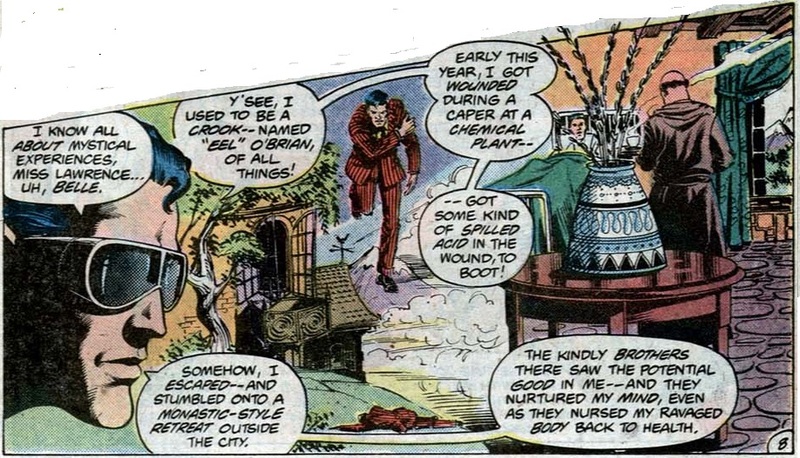 The story is called "The Case of the Bomb Defense Formula", written by Gardner Fox. 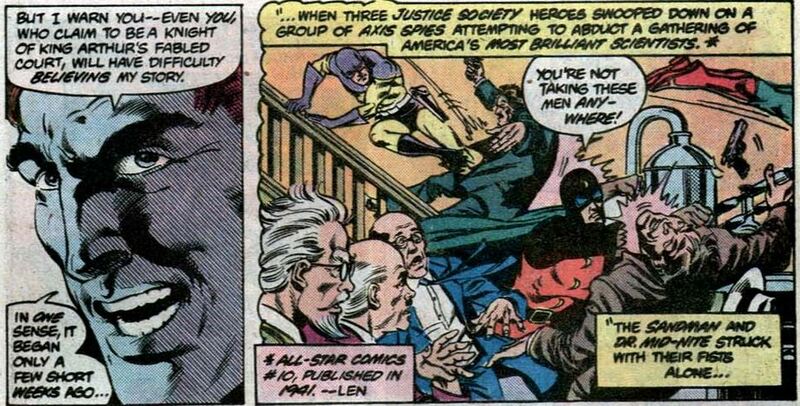 The JSA rescued some brilliant scientists and Per Degaton reveals that he was the assistant to these scientists. The traitorous and opportunistic Degaton stole a time machine from one of the scientists and changed the past by causing Alexander the Great to lose in the battle of Arbela. The Battle of Arbela, also known as the Battle of Gaugamela, was the decisive battle that led to Alexander's conquest of Asia Minor - and is a contributor to the primacy of the West as a cultural and military power. This change in the past changed the future to such an extent that Per Degaton threatened to be a conqueror in his own right. 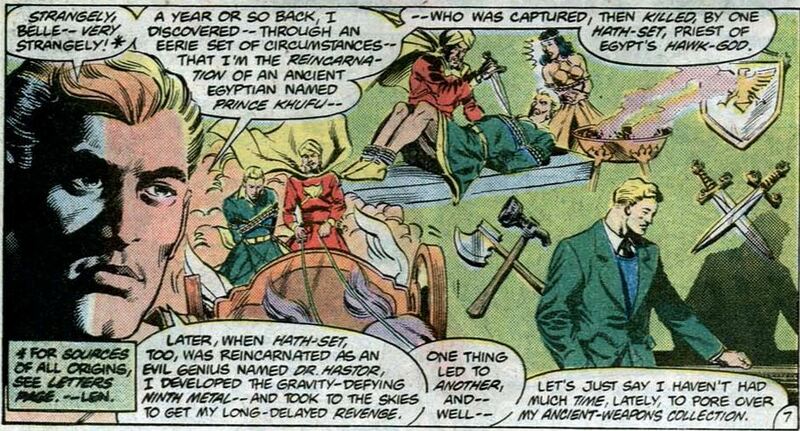 All these was foiled by the JSA, but Per Degaton is nothing if not persistent. This current interference in World War II marks a second attempt at world conquest. 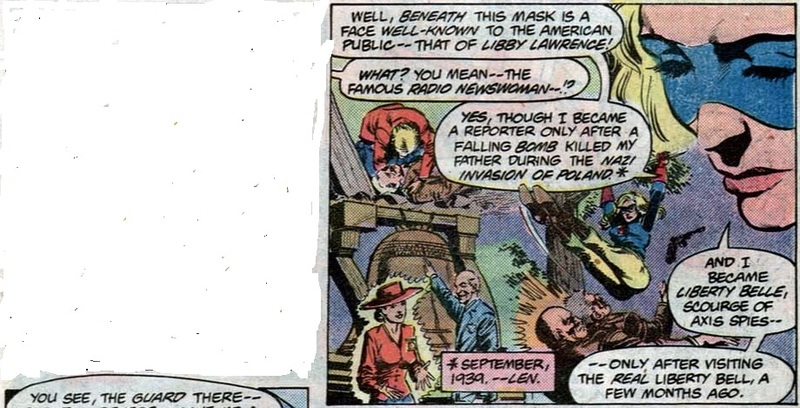 The panel below points to the existence of 'time storms'. These anomalies prevent time travellers from interfering with history. As stated in the panel, one such time storm is in place from September 1939 to December 1941. 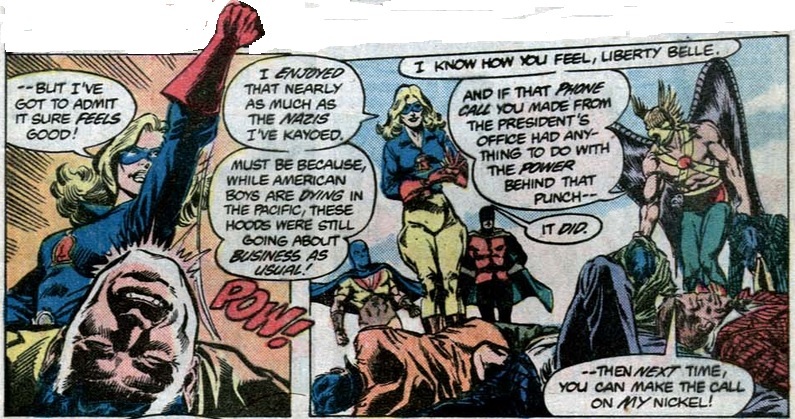 Per Degaton explains how he was able to defeat most of the Justice Society. 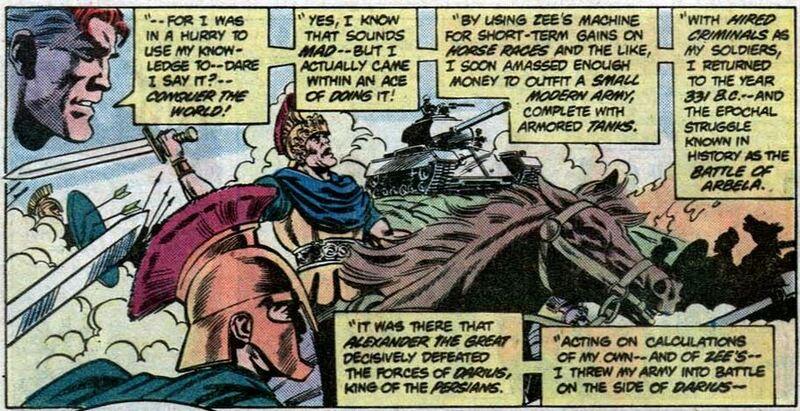 He gathered the JSA's foes from different time periods which explains the small army of villains he has with him. What it doesn't explain is how Degaton can compell these powerful characters to do his bidding. Degaton intends to force the U.S to deal with Japan first rather than Germany. According to Degaton this will create a stalemate on all fronts rather than the victory in Europe followed by a victory in the Pacific for the Allies. Degaton intends to take advantage of the stalemate to bring to fruition his own plans of conquest. From San Francisco let's head over to Hawaii to find the Shining Knight and Danette Reilly in fetters. When Danette lunges for Sir Justin's sword her restraints vanish. She manages to free Sir Justin the same way. 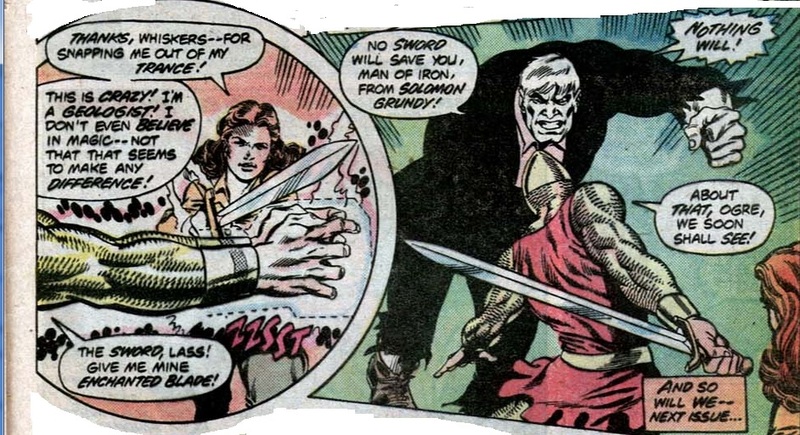 It's time for round two between the Shining Knight and Solomon Grundy. Let's leave them to it and go back to the skies over San Francisco where the Sky Pirate leads a squadron of fighters. On the streets below we have the welcome addition of Phantom Lady. 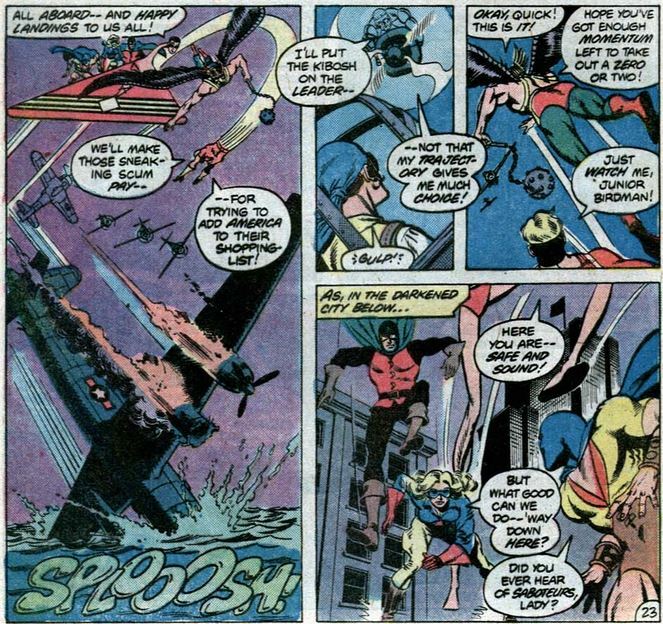 The attacking Zeroes come across the bomber transporting the All-Star Squadron. The heroes quickly divide into ground and air forces. 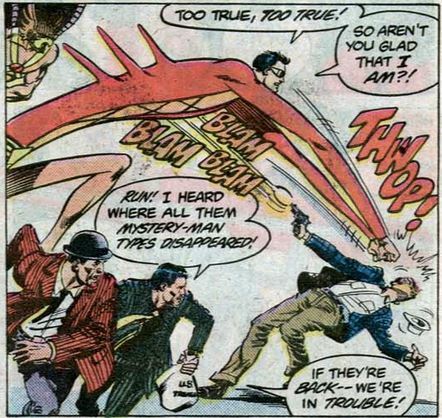 In the city, thieves take advantage of the mayhem but the All-Star Squadron and Phantom Lady stop them. 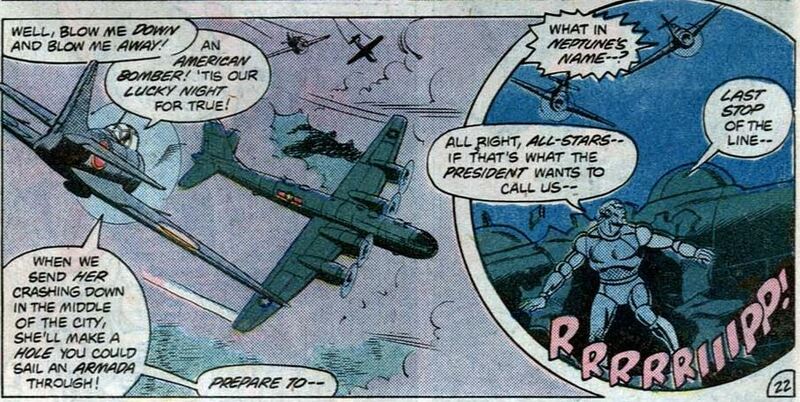 In the skies above, Robotman interrogates Sky Pirate. 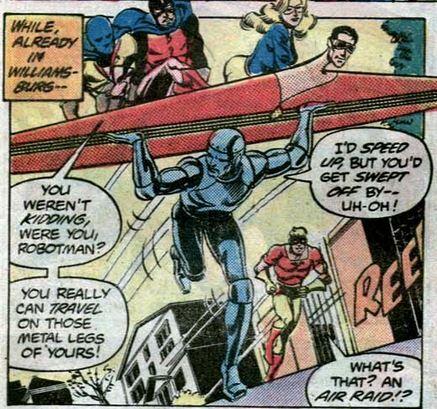 Hawkman and Johnny Quick take care of the other planes. The panel below shows Hawkman giving the flightless Robotman an assist but what I like about it is it gives us an idea of just how heavy Robotman is. He's like a walking tank. 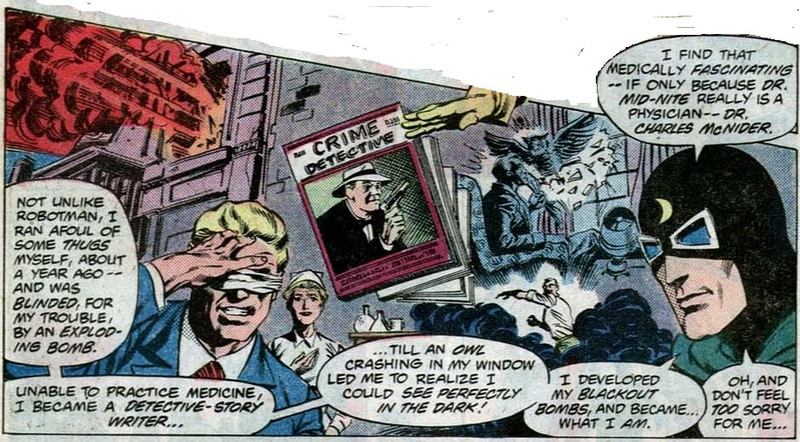 Per Degaton was hoping that with his capture of most of the Justice Society no more masked adventurers would be able to come in and foil his plans. 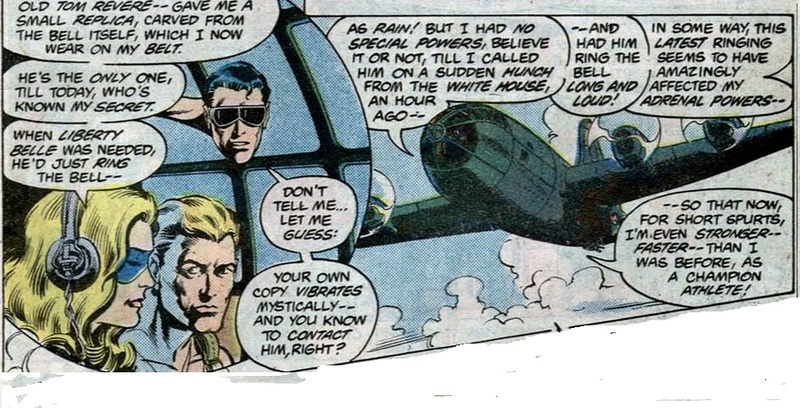 The All-Star Squadron convinces him otherwise.